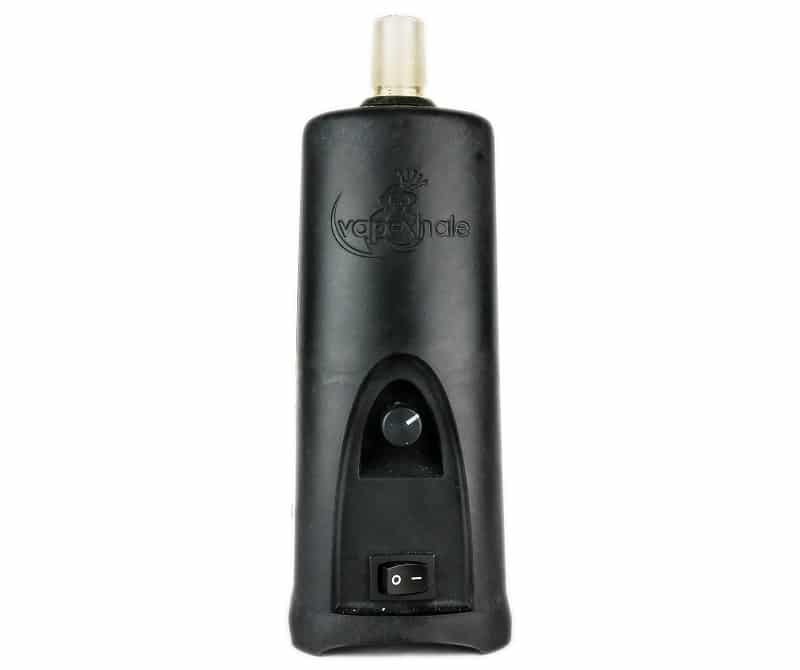 The Cloud EVO is a premium convection desktop vaporizer made by the manufacturer VapeXHale. The EVO specializes in offering the best of the best in vapor production via its powerful heating method, all-glass vapor path and various Hydratubes. If offers the ability to vape concentrates as well as dry herbs, and you can easily vary the amount of herbs in the loading baskets for personal preference/efficiency. I created this Cloud EVO review after about 8 months of solid daily use with multiple different glass pieces and various materials (waxes, crumble wax, dry herb). If you are looking for a hard hitting, basically bong like vaporizer, the CloudEVO is going to be your best bet in the desktop market. If you are looking for the best desktop for efficiency, you might want to check out the E-Nano or another log style vaporizer. But what about the Volcano you say!? The Volcano is great for getting a consistent dosage every day via the bag delivery system. You can easily toss the bag around the room for group sessions and I’ve been using the Volcano pretty much daily for over six years now with no problems at all. With that said, the Volcano doesn’t get me to the levels the CloudEVO can and I feel like I’m getting a little better experience overall with the water Hydratubes. The VapeXNail attachments provide an easy way for concentrate use but no bag delivery method on the CloudEVO. You can click here to check out the CloudEVO from VapeXhale directly. They are usually running some good deals and use code “vaporizerwizard” to get 10% off. So lets get into the VapeXhale Cloud EVO vaporizer review. The CloudEVO is a table top vaporizer standing about 8 inches tall, 3 1/4” deep and 3” wide without any glass attached to the top. The “standard starter kit” comes with a standard glass mouthpiece that looks like this and adds about 6-8 inches to the top of the unit. You can also add one of the VapeXHale Hydratubes for water filtration and they will add about 6-10 inches as well. 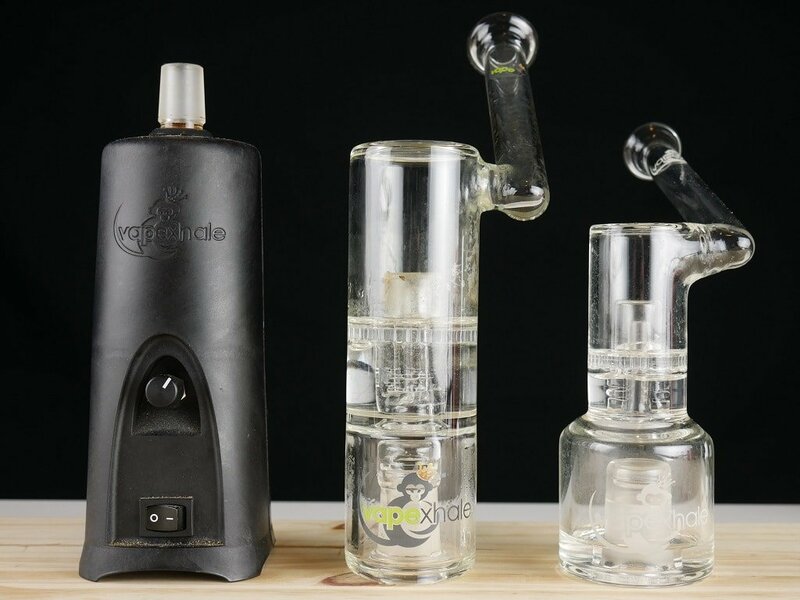 The base unit is not that big but after you add the glass attachments, it becomes more of a stationary vaporizer and not something that you would want to be traveling around with. It’s much smaller than the Volcano but over twice the size of the E-Nano. I really like the overall design of the CloudEVO and the base sits firmly on my desk even with the glass attached. I do however Velcro the HydraFoot to my desk so I don’t pull it up when using the HydraTube. The on/switch is very high quality, easily accessible and very easy to operate. Full counter-clockwise will turn the unit off and full clockwise will put you at max temp. With the standard package, you will get the CloudEVO, (1) standard mouthpiece, (2) two herb baskets and (1) VapeXNail concentrate attachment. I highly recommend checking out some of the packages with a HydraTube. This is really where this unit shines and definitely the most enjoyable experience for me. Each Hydratube offers different levels of diffusion and flow levels so feel free to hit me up with below in the comment section if you have any questions. I personally recommend something with an average level of diffusion. Too much can take away the taste of the herb. The CloudEVO uses a ceramic heating element and a patent pending “PerpetuHeat” Thermal Technology System. This system allows the unit to precisely adjust temps based on the users inhale or a “true convection” heating method. Basically you are not using any of the herbs in the chamber unless you start to draw. In my experience the heater is very powerful can produce HUGE clouds that are very tasty and I pretty much use it for that purpose. The CloudEVO heats up in a little over two minutes which is about the average for a desktop vaporizer. Most of the desktops are pretty much designed to just be on and stay on but the CloudEVO has a 30 minute shut-off feature that I’m not too fond of. I understand it’s for safety but it seems like every time I come in to hit the EVO, it’s blinking red/green lights at me (standby) and I have to wait for it to heat back up. With my Volcano or E-Nano, I just leave them on all day and turn it off before I head to bed. They are always ready to hit instantly which is nice but not a huge deal in the scheme of things. The temperature is operated by a radial dial and they use a clock to estimate temps. So 7:00 on the dial will be 200F and the lowest temp setting while 5:00 on the dial is 500F and the max setting (for concentrate uses). 12 noon is 350F. My preferred/favorite temp for the CloudEVO varies on the materials that I’m using. But for dry herbs I like to stick around 1-2 and for concentrates I’m usually around 3-4. This will all vary depending on your herb types, materials, and what kind of HydraTube/Mouthpiece you decide to go with. I really like the dial approach to temperature control because you can really fine tune each session. The CloudEVO is extremely easy to use from the get go. Just flip and the power switch and select a temp. Usually it’s still on my preferred temp from the last time I used it and it will just automatically begin heating to that temp. The CloudEVO top glass piece will glow red while the unit is heating up, green when the unit is at your desired temp and it will blink red/green when the unit is in auto-shutoff. From here just grind up some herb. I prefer to use a Santa Cruz Shredder or Space Case, something with a normal consistency. Not too fine, not too clunky. Next load the herb into the “EZLoad bowls” or “Herb Baskets” as they call them, place it in the top when the unit is heated up and place the mouthpiece or Hydratube over the top of the unit. From here, I usually let it sit for about 5 seconds and then begin my draw but you can start drawing immediately if you want. Now if you are using concentrates it’s basically the same method except you will be using the VapeXNails. If you notice on the side of the nails you will see an open slit, kind of like an old school train whistle and that’s where I load in my concentrates. I normally have some crumble wax so it’s pretty easy to just drop it in. I don’t like to load from the top because it sometimes sticks to the sides and makes a bigger mess. I highly highly recommend picking up extra ELBs (EZ load bowls/herb baskets) and a couple extra VapeXNails if you will be using it for concentrates because they tend to get dirt pretty fast and it’s nice to have extras around. The HydraTube is really what makes CloudEVO so special. Don’t get me wrong, it will still produce excellent results with the standard mouthpiece but you can take much bigger draws with the added water filtration. Each of the Hydratubes they offer will have varying draw resistance and diffusion. For instance, I have the HydraHoneyComb and I honestly think that it has a little too much diffusion but some people might like that. The VapeXHale Turbine might be the best option if you are looking for the best possible flavor and the VapeXHale HydraBomb will have the least amount of resistance or the highest amount of flow. They also offer non-hydratubes or “conventional” glass bubblers that will work better for someone not looking for any diffusion. The CloudEVO comes with different accessories depending on what package you decide to go with. The standard kit comes with everything you need to vape dry herbs and concentrates but only comes with the standard mouthpiece. This isn’t a bad package by any means, the only downfall is the higher temps will be harsher on your throat without water filtration. The next kit is the “concentrate package” which is the exact same as the standard but it comes with the VapeXhale Adapter Kit which allows you to connect the CloudEVO directly to YOUR 18 or 14mm glass pieces. This is the perfect setup for someone that already has glass options available at home. The next kit is for someone that doesn’t have any glass at home and wants to vape both dry herb and concentrates. You don’t have to use concentrates but it does come with a VapeXNail attachment if you need it. This kit includes the selection of a VapeXhale Hydratube which I talked about earlier. Each of the Hydratubes offers different levels of diffusion and taste. If you wanted the best flavor, check out the Turbine Hydratubes, the HydraBomb for the best flowing bubbler, and the HydraHoneyComb or SideTree for the most diffusion. All of the CloudEVOs in this package come with a VapeXheat Shield that slides over the unit and makes it easier to hold in your hands. I personally just leave it on a desk without the shield and the unit is tall enough with glass that I can hit it while standing up. But if you were planning on taking it on the go then I would definitely use this shield. The top of the unit does get hot with prolonged use but I’m never really touching that part of the unit when I’m using it. The cleaning and maintenance is fairly easy as long as you do some preventative maintenance in between full cleans. For example, after each session I take a little brush and wipe out the inside/outside of the herb basket. Then after about 15 bowls I will soak the dry herb basket in ISO for about 10 minutes and then rinse them out really well. Let them completely dry before using them again. I have like 3-4 herb baskets and 3-4 VapeXnails but I have a couple roommates that use it as well so you could probably get away with 2-3 of each. The VapeXNail attachments for concentrates are more difficult to keep clean. They recommend ISO and salt which works for the most part but the bottom of the nails stay pretty black for me. Maybe someone has a better solution to clean the VapeXnails?! (Leave it in the comments, plz ty) You can also do burn offs with the nails in the unit and try to wipe out the materials while it’s hot. Just be careful not to burn yourself because the bottom portion of the nail will be very hot. The CloudEVO comes with a limited (3) three year warranty covering against defects in material or workmanship under normal use. You will need to register your CloudEVO first to receive service if you ever need it and the VapeXhale team has always been very helpful with any issues. They also offer a 3 Year Platinum Warranty that covers accidental damage or breakage one time within the warranty period. This covers both the unit itself (CloudEVO) and the Hydratube. It also covers shipping costs for product repairs and first priority on warranty service. You can purchase this when you buy your CloudEVO or you have 90 days after your purchase to add it on. As I mentioned above, the CloudEVO is the best desktop vaporizer to replace your bong. The hits are extremely powerful if you want them to be and the Hydratube water filtration lets you get even bigger draws. I really like it for this reason but for the most part I still use my Volcano daily. The Volcano is a very consistent and proven system. I’ve used my Volcano daily for over six years now and I haven’t had a single problem. I did have to send in my CloudEVO to have my bamboo replaced after it cracked. The Volcano is like a tank built to last whereas the CloudEVO is the Ferrari with the high maintenance costs BUT extreme performance. The warranty covered my bamboo glass and I had my EVO back in under 10 days so it wasn’t a huge deal but it might have been had I not had a replacement vaporizer. Each person will look at this differently and neither unit is a bad choice. If you are looking for the most efficient desktop vaporizer, I would check out the E-Nano. I’ve been testing this for over a month now and I’m blown away by how little herb it takes to get me where I need to be. I’m not a huge fan of the water attachment and it does have a bit of a learning curve but it offers pure convection heating with a glass stem at half the price of a CloudEVO. It just doesn’t produce the clouds or allow for a good water filtration option like the Hydratubes on the EVO. Last option would be the Extreme-Q. I personally haven’t used the Extreme-Q in quite a long time but it definitely has a place still in the market. The EQ offers the ability to use bags or whips in the same price range as the E-Nano. The vapor quality is decent but it takes longer to fill bags than the Volcano and no valve system to stop the vapor from escaping. Overall the CloudEVO is the desktop vaporizer I would choose if I was coming straight from bongs, dabs, steamrollers, etc… If you are a heavy user and you’re looking for a vaporizer to either replace or fill those glass pieces, you should pick up the CloudEVO. If you don’t need that, check out the Volcano, or E-Nano. You can click here to check out the CloudEVO and different packages available directly from VapeXhale. They are usually running sales depending on the time of the year and you can use code “vaporizerwizard” for 10% off! 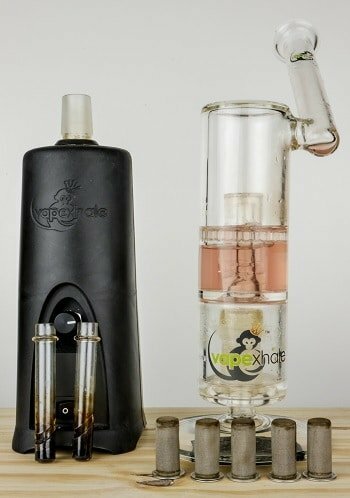 Thanks for checking out my VapeXhale Cloud EVO vaporizer review and let me know if the comments below if you have any questions about the EVO or any other vaporizer. Want more info? Click the picture above to check out my best desktop dry herb vaporizers for 2017. This CloudEVO is one of the most powerful desktop vaporizers on the market and will definitely make your eyes water. Pick up the Cloud EVO vaporizer if you're looking for huge clouds and the option to vape different kinds of materials (wax/dry). Appreciate the kind words James, glad you are enjoying your Pax 2, and you will definitely enjoy your Evo as well! Another awesome review buzz! I am currently in the market for a new desktop vaporizer with the vapexhale cloud evo and volcano classic as my top options. Both have great deals right now for the holidays but i can’t pull the trigger! I like the massive vapor the cloudevo produces especially with concentrates. I am a bong user right now so I feel this vaporizer suits me. However, I do question the cloud evos build quality. How did your bamboo glass crack and has their been any other issues since? If I had to send in the vapexhale to repair I’d be left with my bong again :( Thanks for your informative reviews as always and happy holidazes! It did crack once and it was gone for about 7-10 days. No other issues. Great customer service and warranty coverage but the Volcano is pretty hard to beat in terms of reliability. No concentrates with the Volcano unless you use a mesh pad. It works but it’s not like a draw from the CloudEVO. I like them both but I always find myself returning to the Volcano for its simplicity, ease of use, and the lack of maintenance needed. Happy Holidays to you as well! Thank you for checking out my site and let me know if you have any questions! Hey man, nice review I’ve read pretty much every online review been on forums and seen all the YouTube videos, I have a question despite all that. The new mini hydratubes.. I emailed vapexhale and basically was told there isn’t much of a difference at all, but if mini hydratubes were made there must be a difference in use. For example the hydrabomb comes in mini and standard sizes. My question to you is do you think the smaller one has more resistance since its smaller?vapexhale said the minis are more efficient so I asked if that meant the minis are an upgraded version then. Maybe thicker vapor because of that? Does it use less water or is that part of the tube still similar in size? Vape hale said the minis actually may hit a little easier and should hit about the same, in fairness I’ve read some reviews on their site that say the minis don’t have an issue with taking in the same size hit but I wonder. I wonder if you have to take a longer hit with a mini to get the same volume of vapor as the larger one. Which hits heavier is what I’m looking for, a hard hit. What do you think about let’s say a mini hydrabomb compared to the larger? It’s crazy to me that they are the same price. I haven’t tried the mini yet but I use my CloudEVO pretty much daily so I’ll pick one up. I really can’t even guess as to what the difference would be. I did think about it and really there are too many variables. I’m going to reach out to them and see if I can get a mini super quick and then I’ll get back to you. Maybe a week? I’m pretty excited to try it out. Let me know if you pull the trigger on one or the other and I’ll update this article when I get the mini and test it out. Yes! I did! The smaller version seems to have slightly better flavor. It uses less water so maybe not as good for higher temp draws but much better if you want the purest taste. It’s a bit smaller height wise but the base is a fatty. I got the hydra honeycomb mini. I think the minis are marketed more for concentrate use with their nails. Smaller capacity i think is one of the biggest differences. Lately I am usually right around 2 o’clock and for the increase flavor you do trade a bit of smoothness but not by a lot, it also does have a bit less airflow than the regular honeycomb. I am really digging the wider base on all the new hydratubes they are MUCH more stable. Thanks Buzz you helped me make my decision with confidence, I used your promo code, no one out there as helpful as you! I appreciate the kinds words, definitely come back and let me know how you like it arrives! Ordered mini honeycomb couple days ago .. Said it had a turbine + diffusion so I thought 2 in 1 more for money…Got a standard mouth also might try to order another if I like it maybe a factory second hydrabomb (100bux) and bunch of screens and more tubes. Nice site. Read and really appreciated how engaged, detailed, in-depth and articulate your feedback AND follow-up comments are in response to questions presented to you Buzz.